These are super easy to make because they don’t contain any yeast, which can be time consuming (and I don’t have time to consume!). They are also eggless and dairy-free (so yeah they’re vegan! ), but definitely not free of flavor. I found the dough a bit of a pain to work with though, so I ended up adding probably about another cup of flour because I couldn’t get the dough to stop being so sticky and unmanageable. Preheat oven to 410. Make the “buttermilk” first and set aside. Mix all dry ingredients together (except the additional 1 cup of flour). Add buttermilk and melted Smart Balance, and stir. Gradually add the additional cup of flour until you can gently knead it with your hands. It will not be a stiff dough, but rather flexible. Half the ball of dough and dust countertop well with additonal flour to keep it from sticking. I tried to roll the dough out with a rolling pin, but that didn’t work hardly as well as flattening it out and shaping it into a long rectangle with my hands. Once it’s flattened out into a rectangle, mix up the filling ingredients in a bowl and spoon 3-4 tbsp of the mixture onto the dough, then roll it up, cut into slices (about 1 inch thick) and place on a cookie sheet generously sprayed with non-stick spray. Repeat the process for the remaining ball of dough. Bake for about 15 minutes or until the dough is done. 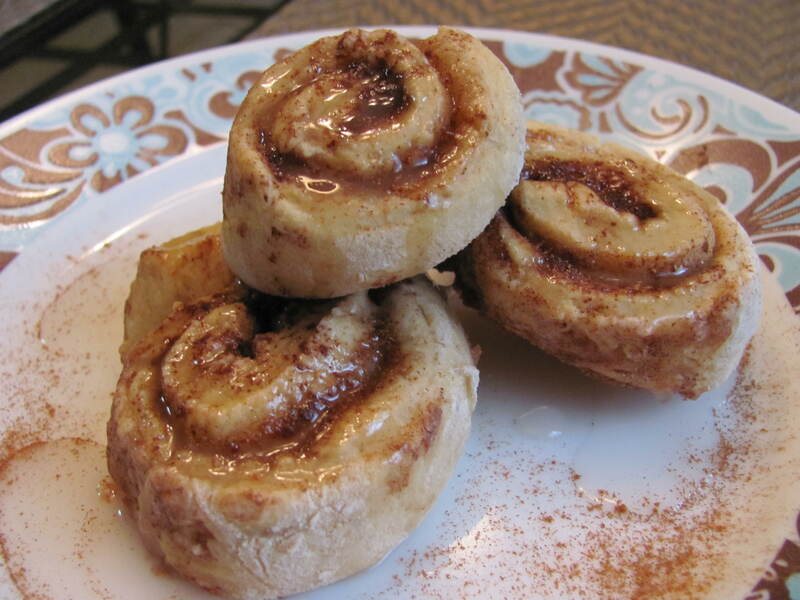 Mix the glaxe ingredients together in yet another bowl and spoon over cinnamon buns when fresh out of the oven. Makes about 20 cinnamon rolls. Best when served hot and with lots of glaze! Oh My..Must Make These Soon…Look AMAZING. I am scrolling thru your recipes and they are all amazing sounding, good job, I will def be getting into these. Thank you! That ARE amazing lol. There’s no yeast or egg so you might have to douse them in more glaze but I don’t think anyone would complain about more sugar!